I just finished reading Matthew Alexander’s anarchocapitalist novel, Withur We. Was I entertained? Bored? Convinced to throw Molotov cocktails at government buildings? Continue on, dear reader, and find out. 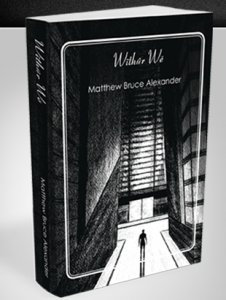 Matthew Alexander’s freshman effort, science fiction novel Withur We, is a powerful, and surprisingly nuanced story that manages to be great fun while at the same time illustrating the superiority of Austrian economics and allowing the reader to explore a working anarchocapitalist society. The lengthy novel (696 pages in the PDF version) tells the story of Alistair Ashley 3nn, a young ex-marine from the planet Aldra, who returns to his hometown greatly changed by his experience in a galactic war to subdue the laissez faire society of Kaldis. Alistair, never one to support the big government designs of the two competing political parties on his home world (the bumbling Voluntaryists and the brutal Realists) returns from the open libraries of Kaldis with a decidedly anarchist bent. When the Realist party begins seizing power and setting Aldra on the road to a tyrannical dictatorship, Alistair joins a growing rebellion and helps touch off a planet-wide civil war. Alexander combines an eminently readable writing style with exposition, for instance, on planetary and astral science, that adds to and fits within the narrative rather than taking the reader from it. Included also is a fair dosage of Austrian economics and anarchocapitalist theory, presented in such a way that the reader is able to grasp key concepts intuitively. For example, in one scene Alistair, in an attempt to jump-start his anarchist society, seeks to convince the chief of a primitive tribe on the prison planet of Srillium to accept his private arbitration services. Particularly enjoyable are the nuanced nature of Alexander’s characters. Alistair isn’t some morally perfect superman, he has doubts and failures (quite a lot of them, actually), and the bad guys seem to be acting out of genuine conviction, not some innate evilness (save one). This is a book that presents the author’s views without beating you over the head with them, and for this reason (not to mention the clear writing and rip-roaring sci-fi plot) it’s an incredibly easy novel to recommend. Where the the book stumbles a little bit is the very beginning and the very end. It takes some persistence to get through the first couple of chapters, after which the story really picks up speed and leads to a middle portion that was so engrossing it had me staying up late at night to read. Unfortunately Withur We again loses steam towards the end and culminates in a slightly pessimistic, slightly hopeful, but ultimately unsatisfying ending. It seems to be a novel calling out for a sequel, and we definitely hope Alexander writes one. Get the free PDF version hereÂ and see a trailer for the book here. Thanks for the great review! I’m thrilled you enjoyed it. A think a sequel may appear someday, but maybe not for a little while. A sequel would be great, but we’ll also be looking forward to any other fiction you’re working on!